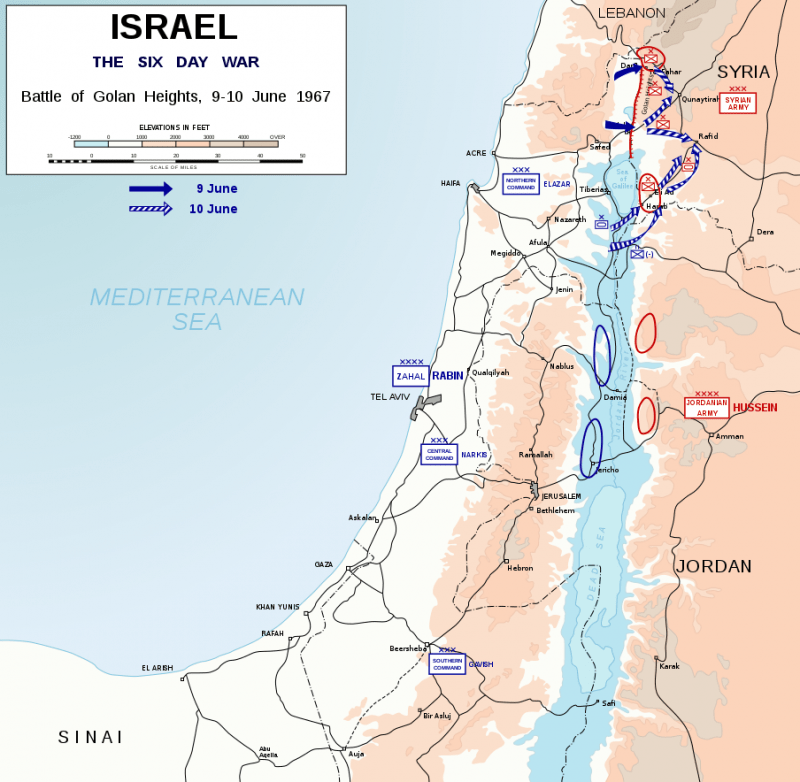 The Six Day War involved three distinct battlefronts: Sinai, West Bank and Golan. was the third of the Arab-Israeli wars. As usual David defeated Goliath. During the 60’s the three major “neighbors” of the State of Israel, each in its own way, chose an aggressive strategy towards the Jewish state. The Syrian army used the Golan Heights, which tower 3,000 feet above the Galilee, to shell Israeli farms and villages. Syria intensified its bombardment of Israeli settlements across the border more frequently in 1965 and 1966. During an air battle with Syria in April 1967, the Israeli Air Force shot down six Syrian MiG fighter jets. Palestine Liberation Organization (PLO) was formed in 1964. In 1965, there were 35 raids against Israel from Jordan, the Gaza Strip, and Lebanon. In 1966, the number increased to 41. In just the first four months of 1967, 37 attacks were launched. These attacks led to leading to costly Israeli reprisals. King Hassan II of Morocco secretly recorded the meeting of Arab leaders in Casablanca. This gave the recording to the Israelis allowing the Israelis to learn that the Arabs were gearing up for war. Egypt (known at the time as the United Arab Republic) massed troops on its border with Israel. On May 16, 1967 Nasser ordered the UN Emergency Force (UNEF) to withdraw. On May 22, Egypt closed the Straits of Tiran on the Gulf of Aqaba to all Israeli shipping with a naval blockade against all ships bound for Eilat. This cut off Israel’s oil suppy from Iran. The was a 20 day period of increasing tensions between Israel and the Arab states when both sides awaited to oncoming war. The Israeli government had to demonstrate a national consensus behind the decision to go to war. Prime Minister Levi Eshkol decided on the night the war began to invite opposition leader Menachem Begin to join the “Unity Government”. Moshe Dayan was appointed as Defense Minister. Israel launched a pre-emptive strike against the Egyptian army and airforce. The gamble paid off. At 7:10 a.m. Israeli time, sixteen Israeli Air Force Fouga Magister training jets took off flying routine flight paths and using routine radio frequencies. They looked to Arab radar operators like the normal morning Israeli combat air patrol. At 7:15 a.m., another 183 aircraft—almost the entire Israeli combat fleet—roared into the air. They headed west over the Mediterranean before diving low, which dropped them from Arab radar screens. The fleet neared Egyptian ten Egyptian airfields (and later an additional fourteen airfields) at 0745hrs Israel time (0845hrs Egyptian time). This is the hour when all the pilots and flight crew were having their breakfast or were still making their way to work. “By chance” the commanders of the Egyptian armed forces and air force were away from their posts on an inspection tour, flying aboard a transport plane. It was here that the Israelis deployed a secret weapon: the “concrete dibber” bombs, the first specialized anti-runway weapons to destroy runways. With the Egyptian army in retreat the IDF continued to move westward toward the Suez Canal. To penetrate into the open spaces of the Sinai, and fight the kind of war in which the Israel Defense Forces excelled, a war of movement and maneuver. The air force, which was now free of the pre-emptive strike, could now work together with the ground forces. Within three days the Israelis had achieved an overwhelming victory on the ground, capturing the Gaza Strip and all of the Sinai Peninsula up to the east bank of the Suez Canal. So, after 96 hours the war in Sinai was over. The Jordanian Arab Legion deployed 45,000 men on the West Bank and south of the Dead Sea. There was an Iraqi brigade on the east side of the Damia Bridge, with three more on the way. Two Egyptian commando battalions were deployed near Latrunt. 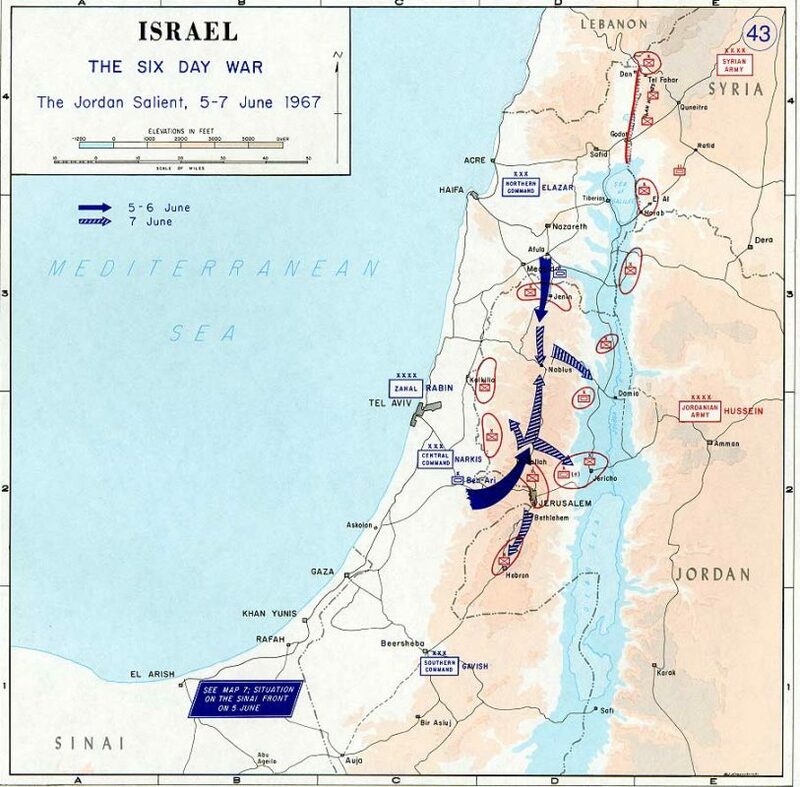 On June 4, 1967, Israeli Prime Minister Levi Eshkol relayed a message to Hussein: “We shall not initiate any action whatsoever against Jordan. However, should Jordan open hostilities, we shall react with all our might and (Hussein) will have to bear the full responsibility for all the consequences.” At 8:30 a.m. the following day, Jordan started shelling western Jerusalem. The building next to my student apartment in Jerusalem was hit by one of these shells. 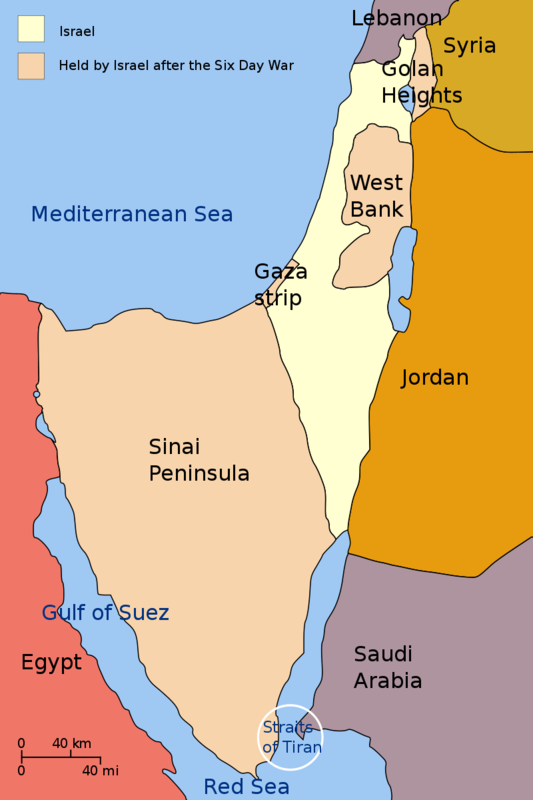 Jordan initiated offensive actions against Israel from the eastern portion of Jerusalem and from lands it occupied west of the Jordan river (the West Bank). After a three days of fierce fighting, especially in and around Jerusalem, Israeli forces defeated the Jordanians and gained control of all of Jerusalem as well as the West Bank. Approximately 325,000 Palestinians living in the West Bank fled to other parts of Jordan, primarily to avoid being caught in the cross-fire of a war. Rabbi Shlomo Goren, the chief chaplain of the Israel Defense Forces, blew a ram’s horn at the Western Wall to announce the reunification of Jerusalem. The 64 km border from Kibbutz Tel Dan in the north down to the Sea of Galilee occupied the high ground. Following an air attack by the Syrians on the first day of the war, Israel dealt a shattering blow to the Syrian air force. On June 8, the fourth day of the war, Syria accepted a UN cease-fire, but broke it after only five hours. Israeli forces began to move north in huge convoys. On fifth day of the war, the Israelis mustered enough forces to remove the Syrian threat from the Golan Heights. On the morning of June 9 the Israeli air force began an intensive three hour bombing of Syrian positions in the Golan. Before noon Israeli forces under the command of Major General David Elazar crossed the armistice line into Syrian territory. The plan, if activated by order of the prime minister and military chief of staff, was to send a small paratrooper force to divert the Egyptian Army in the desert area so that a team could lay preparations for the atomic blast. Two large helicopters were to land, deliver the nuclear device and then create a command post in a mountain creek or canyon. If the order came to detonate, the blinding flash and mushroom cloud would have been seen throughout the Sinai and Negev Deserts, and perhaps as far away as Cairo. By the end of the war, Israel had conquered enough territory to more than triple the size of the area it controlled, from 8,000 to 26,000 square miles. The stunning 1967 enabled Israel to unify Jerusalem. Israeli forces had also captured the East Jerusalem, Sinai Peninsula, Golan Heights, Gaza Strip and West Bank. In Israel there was euphoria. Israeli casualties – 700. Israel now ruled more than three-quarters of a million Palestinians. The Arab countries’ casualties were disastrous. Compare the difference in the losses of both sides. The defeat demoralized both the Arab public and the political elite. For Palestinians, The Six Day War ( النكسة, an-Naksah, حرب ۱۹٦۷) meant occupation and more displacement. For surrounding Arab countries (Egypt, Jordan and Syria), it meant crushing military and reputational defeat. Israelis thought that routing the Arab armies would convince their leaders they had no hope of destroying Israel and would agree to a peace agreement. The Arab League Summit in Khartoum in August 1967 declared the Arab position toward Israel would be no peace, no negotiations, and no recognition. The Six-Day War didn’t only transform Middle East politics: It also transformed religion far beyond the region. The war impacted the way Islam is expressed in the Arab world. It also strengthened a messianic strain in Israeli Judaism.